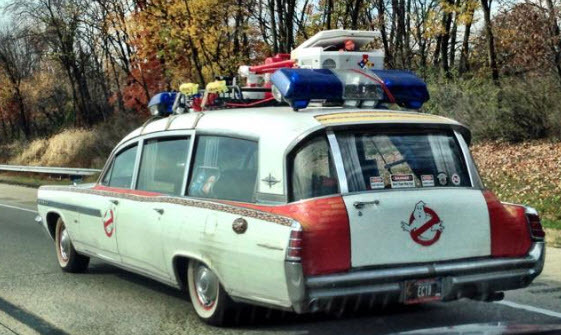 I encountered the Ghostbusters crew driving on I-81 South, Near Carlisle, Pa. I posted this to FB on Monday, but promised it as a blog post. I believe it shows that we don’t have to wander through life, listening to country music, and hoping for something to kill the boredom. The digital world is a cornucopia of important and entertaining information. My wife Nancy and I decided on the spur of the moment to take her Connecticut to visit her Mother. That means I was the road nearly 20 hours. Yes, I listened to some Nascar, but I determined not to waste my time. Here are some of the things I found. Open source resources: Building a house, cell phones; Linux; the T.E.D. Radio hour. Not the most fascinating: How open source information can change our lives. Paul Simon sings one of my favorites: An American Tune: An American Tune . Fareed Zakaria: Interviewed Richard Dawkins. He explained why every Republican candidate is disingenuous or ignorant in challenging an established scientific fact, Evolution. Carson might as well disagree with Gravity! 🙂 Fareed is available as a free audio podcast, or for a small fee on iTunes. Sorry I don’t have the link. This sounds very, very impressive: Our new printer: 10000 pages before needing a refill: $499. The future of personal loans: www.Prosper.com. Proceed at your own risk.